Christmas has never been a time of joy for Eve and the festive season was made worse when her fiance was killed in Afghanistan on Christmas Day five years ago. Before he left, Jonathan lit a candle and told Eve that as long as the flame is alive, so is their love for one another. It was the last time Eve saw her fiance alive and she has kept the flame going ever since. Eve wants nothing to do with Christmas but it seems her great aunt Evelyn has other ideas. Eve was close to her great aunt but had no idea Evelyn had not only amassed a secret fortune but had drawn up plans and begun the building of a winter theme park. Winterworld will contain everything Eve dreads - Santa, Christmas trees, elves and real reindeer. And just when Eve thinks she's heard the worse, her great aunt's lawyer informs her she isn't the only beneficiary. Jacques Glace is a stranger to Eve but he has jointly inherited Winterworld and the 'many millions' involved in the theme park. Eve takes an instant dislike to Jacques, believing he somehow charmed his way into her great aunt's will. She is determined to catch him out and unmask him as the conman she knows he is. 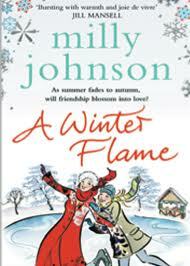 A Winter Flame is a lovely festive read full of the sparkle and magic of the Christmas season. I adore the idea of Winterworld with its enchanted Christmas tree forest, cosy cabins, snow ponies and falling snow. There was such attention to detail when describing the theme park and its attractions that I felt like I was there, experiencing it all. If only! Winterworld is such a wonderful, magical place that I would love to go there and allow it to bring out my inner child. Eve is far from impressed with the plans when she first sees them and is keen to tone down the Christmas theme but slowly she begins to thaw and feel the joy of the season again, helped along by Jacques' enthusiasm and determination to follow through with Evelyn's original plans, and seeing the love of those around her and realising she could be as happy as them if only she would allow herself to be. Eve hasn't been happy since she lost Jonathan but her sadness is offset by the humour in the book, from the local newspaper's printed apologies to Effin Williams, the Welshman overseeing Winterworld's construction, whose put downs are both inventive and highly amusing. My favourite character was definitely Jacques, who was like a giant teddy bear who had scoffed a ton of blue Smarties with his enthusiasm for the project. He charms everybody but Eve and can't help rubbing her up the wrong way. A Winter Flame is both heartfelt and humorous, jam packed with Christmas cheer as Eve learns to start enjoying not only the season but the whole life she has ahead of her. Thank you to Simon & Schuster for sending me a copy to review. I really like the sound of this one! Everyone keeps saying how lovely it was so you guys must be right. I'll have to add this to my wishlist! It's lovely and very Christmassy.